In recent days, the anti-government protests have spread to dozens of cities and towns, including the capital Tehran. 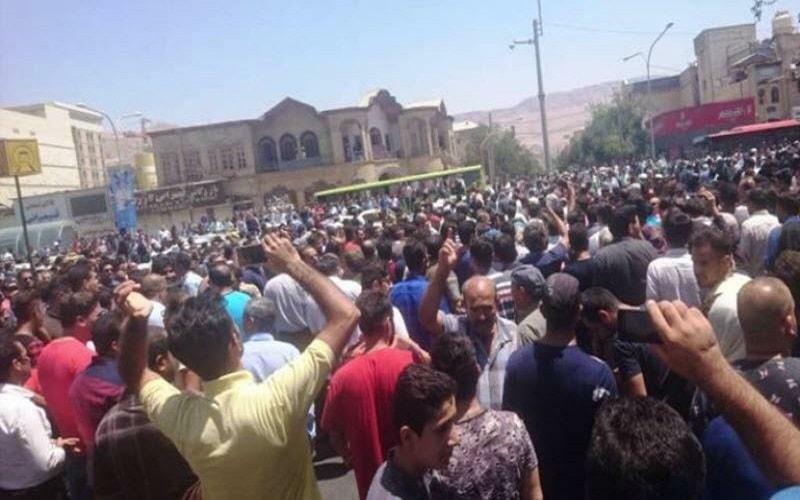 Iranians nationwide have taken to the streets in a remarkable show of anger, demanding the overthrow of the Mullahs regime. Anti-government protests in different cities have confronted police and torn down pictures of Supreme Leader Ayatollah Ali Khamenei and chanted “Death to dictator”, “Cannon, tank, firecracker, the mullahs must get lost”, “Khamenei lives like a god, while the people live in poverty” — serious acts of defiance in a theocracy that imposes strict limits on speech. Many Iranians suffer from the difficulty of providing a decent living for themselves and their families, and a high percentage of the population live below the poverty line. This unenviable situation led them to chant slogans such as “Death to Rouhani and Death to the Dictator”, “Withdraw from Syria and Think About Us” and “No to Lebanon or Gaza…Yes to Iran,” and “Death to Hezbollah”, declaring their opposition to Iranian policies both internally and externally. Hundreds have been arrested, tortured and one killed until now, according to the reports. Why are Iranian protesting? And What Do Protesters want? The youth are deeply angry over their prospects within the Islamic Republic and many feel they have nothing to lose. Unemployment among youth is officially 25% and job creation has been a significant challenge for the government. Natural resources are being used to support Iran’s regional foreign policy rather than on infrastructure and other bread-and-butter issues at home. Inside Iran, the regime pursued a policy of oppression and discrimination. Iran has suppressed all the voices it opposes at home and assassinated many abroad. Professor Kazem Rajavi of the National Council of Resistance of Iran, a former Iranian ambassador to the U.N., was shot dead in Switzerland in 1990. It has blocked or banned many of newspapers and websites to cut communications and put many of the activists in prisons. The Iranian women have been deprived of the most basic rights such as attending sports in stadiums. They didn’t enjoy the right to freely choose their clothing. They aren’t free in marriage, divorce, education and employment. The spread of corruption, injustice and deprivation put Iranians in constant struggle so as not to die of hunger. At the same time, Iran has made billions of dollars in its regional wars founded on sectarianism and hatred. the billions of Iran’s’ people money are gathered scattered in the sky of Saudi Arabia in the form of hostile ballistic missiles which is available to the Houthis in Yemen. the Iranian-backed Houthi militia continuously launch missile attacks intercepted by the Saudi air defense systems and they witness as Hassan Nasrallah, secretary-general of Hezbollah (listed terrorist group) boast about the billions in funds, saying that as long as Iran has money, we also do; or are forced to see as well explosives or belt bombs secretly sent to destabilize the security of the Kingdom of Bahrain. In the past, an Iranian citizen with an Iranian passport could have traveled to many countries without a travel visa. But after the 1979 revolution, the regime’s policy had completely devalued the Iranian passport and placed it at the bottom of the international passport list. What is the political cause of anti-government protests? Anti-government protests initially focused on Iran’s flagging economy but quickly transformed from economic woes to calls for the overthrow of the regime. The mullahs have ruled Iran for 40 past years, they have been repressed by the iron fist, the people of Iran have been deprived of their basic rights. Over the past 40 years, the Iranian people have repeatedly protested against regime and called for the overthrow of the mullahs, but they have been violently suppressed. Therefore, one should not be surprised at why anti-government protests quickly transformed from economic woes to calls for the overthrow of regime. Who is leading the anti-government protests? The continuous activities of the rebellion units as the inspiring source of uprising bring hope to people but fear to the regime. We can realize the importance of the role played by the PMOI network and rebellion units in the country, simply by observing reactions from the regime supreme leader. The PMOI and the Iranian resistance aim to take advantage of each and all opportunities to build, organize, and mobilize rebellion units inside Iran. Their task is to fuel and encourage protests and strikes. It is the ultimate goal of the resistance to bring people in to scene and set the stage for overthrowing of the mullahs.